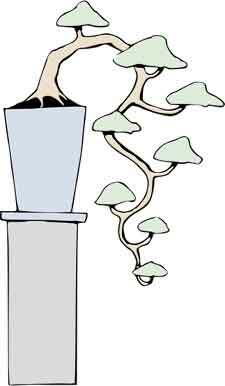 With its trunk growing in a downward direction and being planted in a deep pot for stability, this style represents a tree which is growing from the side of a cliff or mountain. From this position in the wild, the tree reaches out for light and the trunk weakens. With the arrival of heavy snow and ice, perhaps a landslide, and together with its own branch weight, the trunk is bent downwards. The base thus becomes the apex and the most vigourous part of the tree. In bonsai regular thinning of the apex is therefore necessary to allow more energy to flow to the lower branches. 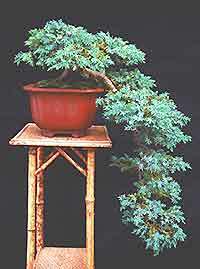 A cascade tree can be trained to allow optimum viewing from either the side or front, and the bonsai normally grows down beyond the base of the pot.